Research News: Of Friction and "The Da Vinci Code"
Of Friction and "The Da Vinci Code"
BERKELEY, CA – The Da Vinci Code, the best selling novel and soon-to-be-blockbuster film, may also be linked some day to the solving of a scientific mystery as old as Leonardo Da Vinci himself  friction. A collaboration of scientists from Lawrence Berkeley National Laboratory (Berkeley Lab) and the Ames Laboratory at Iowa State University have used Da Vinci's principles of friction and the geometric oddities known as quasicrystals to open a new pathway towards a better understanding of friction at the atomic level. Atoms are spaced periodically in one direction on a surface perpendicular to a quasicrystal's 10-fold rotational axis. But at right angles they are spaced in a Fibonacci sequence, in which the ratio of short to long spacings is an irrational number like that of the Golden Mean. Friction is eight times greater in the periodic direction than in the aperiodic direction. In a paper published in the August 26 issue of the journal Science, a research collaboration led by Miquel Salmeron, a physicist with Berkeley Lab's Materials Sciences Division, reports on the first study to measure the frictional effects of periodicity in a crystalline lattice. Using a combined Atomic Force Microscope (AFM) and Scanning Tunneling Microscope (STM), the researchers showed that friction along the surface of a quasicrystal in the direction of a periodic geometric configuration is about eight times greater than in the direction where the geometric configuration is aperiodic (without regularity). Geometric periodicity was confirmed via rows of atoms that formed a Fibonacci sequence, a numerical pattern often observed in quasicrystals  and which was one of the clues to solving the Da Vinci code in the novel by Dan Brown. "That we can get such a large difference in frictional force just by scratching the surface of a material in a different direction was a major surprise," says Salmeron. "Our results reveal a strong connection between interface atomic structure and the mechanisms by which frictional energy is dissipated." Collaborating on the Science paper with Salmeron were Berkeley Lab's Jeong Young Park and Frank Ogletree, and Raquel Ribeiro, Paul Canfield, Cynthia Jenks, and Patricia Thiel of the Ames Laboratory at Iowa State University. The principles of friction, as described by Leonardo Da Vinci some 500 years ago, work fine for macroscale mechanics like keeping the moving parts in the engine of your car lubricated with oil. However, as mechanical devices shrink to nanosized scales (measured in billionths of a meter), a far better understanding of friction at the molecular level becomes crucial. "Friction is difficult to characterize because there are so many different factors involved," says Park. "Scientific studies of frictional force were in limbo for such a long period of time because we simply didn't have the tools we needed to study it at the atomic level." 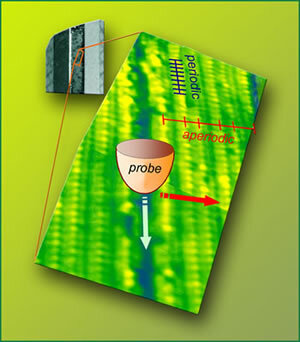 The key tool deployed in this study was the combined AFM and STM. Both microscopes utilize a probe that tapers to a single atom at its tip. This tip is scanned across the surface of the sample to be studied, revealing atomic-level information. In the AFM mode, the tip actually touches the sample's surface atoms like a phonograph needle making contact with a record  but with so little force that none of the scanned atoms are dislodged. In the STM mode, the tip never quite touches the sample atoms but is brought close enough that electrons begin to "tunnel" across the gap, generating an electrical current. "We first used the STM mode to produce topographical images of our quasicrystals and ascertain which direction was periodic and which was aperiodic," says Salmeron. "We then switched to the AFM mode and gently scratched the crystals in each direction to measure and compare the frictional force." At the atomic level, when two surfaces come in contact, the chemical bonds and clouds of electrons in their respective atoms create frictional force and cause energy to be dissipated. From Da Vinci's studies it has long been known that friction is greater between surfaces of identical crystallographic orientation than between surfaces of differing orientation, because, says Salmeron, "commensurability leads to intimate interlocking and high friction." However, some recent studies have reported higher frictional differences, or anisotropy, for incommensurate crystal surfaces when there were periodicity differences. To measure the frictional effects due to periodicity alone, and not to other factors such as chemical differences, Salmeron, Park, and Ogletree worked with decagonal quasicrystals of an aluminum-nickel-cobalt alloy (Al-Ni-Co) prepared by their collaborators at Ames Laboratory, renowned experts on the surfaces of quasicrystalline materials. Stacked planes of Al-Ni-Co crystals exhibit both ten-fold and two-fold rotational symmetry. By cutting a single Al‑Ni-Co quasicrystal parallel to its ten-fold axis, the researchers were able to produce a two-dimensional surface with one periodic axis and one aperiodic axis, separated by 90 degrees. "Strong friction anisotropy was observed when the AFM tip slid along the two directions: high friction along the periodic direction, and low friction along the aperiodic direction," says Park. "We believe the source of this friction has both an electronic and a phononic contribution." Phonons are vibrations in a crystal lattice, like atomic sound waves. The authors of the Science paper said that new theoretical models are needed to determine whether electrons or phonons are the dominant contributors to the frictional anisotropy they report. "Our results finally give theorists a chance to be proactive in their modeling of friction," Salmeron says. "High Frictional Anisotropy of Periodic and Aperiodic Directions on a Quasicrystal Surface," by Jeong Young Park, D. F. Ogletree, M. Salmeron, R. A. Ribeiro, P. C. Canfield, C. J. Jenks, and P. A. Thiel appears in the August 26, 2005 issue of Science magazine . For more information visit the Salmeron Group website, http://stm.lbl.gov/, and Jeong Park's webpage, http://stm.lbl.gov/people/Jeong.htm. Berkeley Lab is a U.S. Department of Energy national laboratory located in Berkeley, California. It conducts unclassified scientific research and is managed by the University of California. Visit our Website at http://www.lbl.gov/.